The blue ribbon of the river framed by the cool green of riverside vegetation, of fertile orchards and vegetable gardens. The dark ochre of hills as round as rolled pebbles, flecked with colour by cistus plants, holm oaks and the occasional olive tree. Houses with walls of schist or baked mud with the dazzle of lime huddled together in hamlets lost among the hills. Such contrasts are to be found in Alcoutim and the surrounding municipality, where, even in mid-winter, thousands of almond trees burst into pale pink blossom. There are open spaces whose natural beauty remains unspoilt, where a multitude of wild flowers are to be found and a fascinating variety of bird species can be observed. The boundaries of Aljezur municipality mark out a broad rectangle delimited by the sea and the hills, and its landscapes reflect this dual influence. While the coast is marked by high cliffs beneath which huddle sandy coves and pristine dunes, the hinterland is a place of rolling hills covered with vegetation that recede, row upon row, as far as the eye can see..
Time spent in Aljezur municipality is thus an opportunity to rediscover peace and tranquillity, to experience a silence broken only by the singing of birds or the crash of waves on the rocks and to savour the beauty of verdant fields, gentle slopes swathed in wild flowers and majestic cliffs with the pounding sea as backdrop. The dusty gold of soft sand, the turquoise blue of warm waters. Vast ranges of hills covered in a bright carpet of wild flowers. 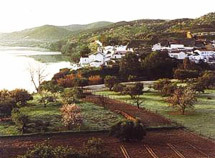 The tranquil countryside along the banks of the Guadiana, lush with orchards and vegetable gardens. These are just a few facets of a municipality that stretches from the sea to tile hinterland, with a river as its boundary. 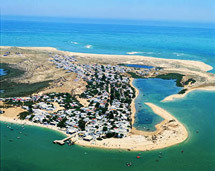 Faro's beaches and the Ria Formosa, where flamingos can be seen taking to the air, mark the border with the sea. On the flat terrain behind are the houses and buildings of Faro, green vegetable plots that thrive on the fertile land and water wheels that were once used to draw water from the ground another reminder of the city's Moorish heritage. In the distance a semi-circle of gentle hills, their slopes clad with fruit trees, frames the landscape. Villages where life goes on at the same easy pace as in centuries past, where unassuming churches conceal art works of astonishing beauty, where vestiges of the magnificence of the Romans still litter the fields. 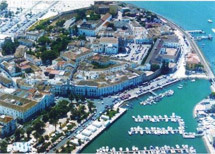 These are among the charms of Faro and its municipality, an ideal starting point for exciting voyages of discovery. A turquoise sea bounded by ochre cliffs and soft, sandy beaches. Bunches of grapes ripening beneath the hot summer sun. The shapes, colours and designs of ceramics that belong to a tradition centuries old. 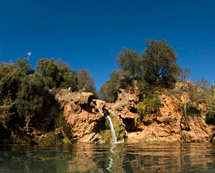 Such are the attractions of Lagoa and its surroundings, along with the colourful fishing port of Ferragudo, the romantic chapel of Nossa Senhora da Rocha perched high above the sea, and the fascinating rock formations of Algar Seco. Gigantic sculptures carved by the pounding waves that plunge into a crystal sea. The iridescent greens of sea caves. 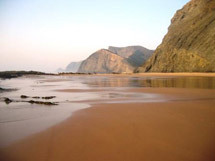 Beach after beach of soft sand tucked away between ochre cliffs or stretching clear to the horizon. Verdant countryside dotted with the white of houses. 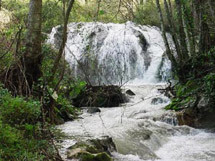 Just a few reasons for visiting Aljezur municipality and discovering one of the most attractive parts of the Algarve. A long ribbon of fine, golden sand tucked between the blue of the sea and the bold ochres of the cliffs. The splendour of tiles in a chapel that is itself a work of art. The changing greens of the orchards and the woods of the hills. An endless variety of decorated chimneys, carefully wrought in a filigree of whitewashed stone and art. Wide open spaces where it is possible to rediscover the meaning of solitude and listen to the silence of nature. With all this and more, Louie municipality is a place of sunshine and colour, fun and excitement. "Green, how I love you green". 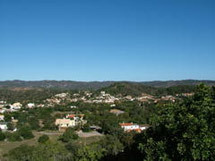 The poet could have been writing of the wooded slopes of Monchique, for after the heat of the Algarve's beaches it is the coolness of the hills that is most striking. These are landscapes that weave a spell of reverie and spur the visitor to stride out in search of unglimpsed horizons that end only in the sea. Here crystalline rivers gurgle between rocks and boulders, while the presence of man is evident in the white dots of houses and the slopes cut into terraces and planted with fruit trees and vegetable plots. The charms of Monchique municipality extend a never ending invitation. Firstly there are the islands, long sand banks that are an ideal spot for swimming and sunbathing. Next come the tranquil waters of the Rid Formosa, a unique natural habitat teeming with plant and animal species. And in the background loom the hills of the interior, ringed like an amphitheatre, covered with orchards, dotted with white cottages. Three distinct environments, each with its special charm, which make Olhão a great place for a holiday. First the blue sea and its gently lapping waves. Then fine, golden sands framed by cliffs and rocks. The cosmopolitan atmosphere of an international tourism destination. 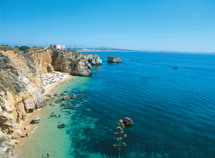 This is the Algarve of beach holidays in the sun. Portimão and its municipality have more to offer though. A rich heritage of historical monuments. The eternal natural beauty of the Ria de Alvor. The charm of cultivated fields, of slopes covered with pine trees and wild flowers. The allure of walking up into the hills and looking down on the Algarve from a new perspective. The rounded forms of hills covered with cistus bushes, oaks and arbutus-berry trees. Landscapes like watercolours, white houses scattered among verdant fields and orchards. Reflections in the slowly moving surface of a river. The play of light and shade on an old whitewashed wall. In such simple things lies the beauty of São Brás de Alportel and its municipality, each an invitation to come, relax and enjoy. The deep green foliage of orange trees in fertile valleys. The blue sea and the fast-paced life of an international seaside resort. The picturesque charm of houses surrounded by almond and carob trees. The broad sweep of hills that are a haven for ramblers and nature-lovers. 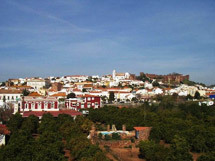 These are among the attractions of Silves municipality, a holiday destination where it is a pleasure simply- to be alive. Beautiful empty beaches with sands that seem to go on forever. Fields of orange trees, heavy with the scent of blossom. Then hills of fig and almond trees and houses with dazzling whitewashed walls and distinctive chimneys decorated to resemble the fine tracery of lace. And last of all, the great open spaces of the hills, where eagles soar, birds sing and flowers bloom. This is just a hint of the charms of Tavira and its municipality, an invitation to come and find out more. The mythical atmosphere surrounding Sagres and Cabo de São Vicente (Cape St. Vincent), places dedicated to the gods for thousands of years. The unspoilt coastline, with its dramatic horizons of cliffs and sea. The many menhirs that bear witness to prehistoric rites. Memories of the epic of the Discoveries and the enigmatic figure of Prince Henry the Navigator. Such are the attractions of Vila do Bispo and its municipality, a vast triangle in which the sea is a constant presence. And where nature combines with history to create a unique region that is worth taking the time to get to know. The pale gold of mile after mile of sandy beaches. The turquoise blue of the sea. The green of pine woods. Brushstrokes of colour from the palette of pleasures that is Vila Real de Santo Antonio and its municipality, natural charms complemented by the lively cosmopolitan atmosphere of a major tourist centre. The tranquillity of a coast where it is still possible to rediscover solitude. The fauna and flora of a nature reserve and a nature park. (Catch the ferry to Cacilhas from Cais do Sobre then grab Bus 101 (€1.35 return)), . 9AM - 6PM. Similar to the Christ statue in Rio de Janeiro, this statue stands over 100 meters tall on the opposite bank of the Tejo River from downtown Lisbon. Views from the top of the statue are breathtaking, although the elevator up will cost you €5. 5 €. Tram 28. Instead of paying for a ride on one of the costly tourist trams, try Tram 28. 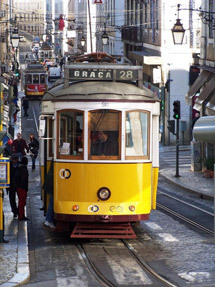 Tram (or "Eléctrico" in the Portuguese) Line 28 is one of only three traditional tram lines that still operate in Lisbon. These trams, which until the late-1980's ran all through-out Lisbon, were manufactured between 1936 and 1947. Tram 28 winds its way through the "Old Town" of Lisbon (dating from the 17th century) beginning in Graça then down to the Alfama and to the Baixa then up through Chiado to Bairro Alto and then down to Campo Ourique, taking you by many of Lisbon's most famous and interesting sites including monuments, churches and gardens. The trip is hilly, noisy and hectic but it affords many beautiful glimpses of the city. And, although the tram can sometimes be overrun with tourists, you will definitely get a flavor of the locals, as many "Lisboetas" commute daily on these historical trams. Tickets cost €1.45 per journey and can be purchased on-board at a vending machine (note that these machines do not accept notes, and are sometime even out of change, so make sure you have the correct change!) From start to finish the ride takes around 30 minutes. Beware of pickpockets. Santa Justa's Elevator, Rua Aurea & Rua de Santa Justa, +351 (21) 361-3054. 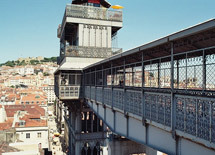 Located downtown, this elevator was designed by a follower of French engineer Gustav Eiffel and connects the downtown to the Trindade, located several meters uphill. 7 Colinas valid. 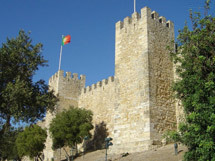 Castelo de São Jorge (St. George's Castle), (Walk up the hill from Alfama or take bus 37), +351 218 800 620. 9AM - 9PM (March - Oct) and 9AM-6PM (Nov-Feb). Located up the hill, with a great view over the city and the river. If you have the energy, get there by walking from downtown, going through the fantastic old neighborhood of Alfama. €7 with student discount available. Aqueduto das Aguas Livres. This is a historic aqueduct in the city of Lisbon, Portugal. It is one of the most remarkable examples of 18th-century Portuguese engineering. The main course of the aqueduct covers 18 km, but the whole network of canals extends through nearly 58 km. The Mãe d'Água (Mother of the Water) reservoir of the Amoreiras, the largest of the water reservoirs, was finished in 1834. This reservoir, with a capacity of 5,500 m³ of water, was designed by Carlos Mardel. It is now deactivated and can be visited as part of the Museu da Água (Water Museum). Chiado. Take a stroll along the historical streets of this elegant shopping district, stopping for a cup of coffee with the statue of Fernando Pessoa, Portugal's great Modernist poet. Head uphill to Bairro Alto, for stunning views of the city and some wild partying in Lisbon's most popular nightclub district. Downtown (Baixa). This part of the city was completely rebuilt after the 1755 earthquake by the Marquis de Pombal. The planned layout, greatly different from what you will see in the more ancient neighborhoods, is a testimony to the ideas of the Enlightenment. Alfama. This neighborhood still bears signs of the Moorish presence in the city, with the buildings very close to each other, and very irregular streets. It's very atmospheric and a great spot in which to wander around. 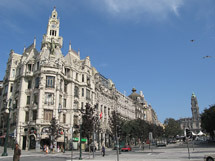 Praça do Comércio, (Take the metro to Terreiro do Paço Station). This magnificent plaza, facing the river, is the beginning of Lisboa's downtown. 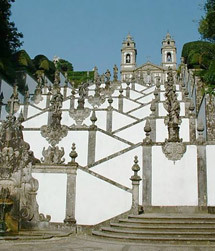 It is also known as 'Terreiro do Paço', meaning 'Grounds of the Palace', relating to its function before the Great Earthquake of 1755. Belém. This monument-packed neighborhood is a must-see place. Take tram 15 to the west, which follows the coast line. Check the route map inside the tram: it helps to find a right station for most famous of Belém attractions. Or take the Cascais suburban train (line "Cascais todos"; the express trains don't stop in Belém) to Belém and walk to the attractions. The extensive bus network also serves Belém from various departure points around the city and can be less busy than the tram. Sintra is both a town and a municipality in the Lisbon Coast/aka Estoril Coast region of Portugal. Its spectacular setting, 28km from Lisbon, houses a Royal Palace, used by generations of Portuguese royalty prior to the 1910 revolution. The surrounding hills are surmounted by the remains of the Moorish Castle and by the nineteenth-century Pena Palace. Historic Sintra is an heritage patrimony sight declared by UNESCO. The Estoril coast is often considered to be part of the Lisbon coast, which includes Cascais, Lisbon, Sintra, and other nearby municipalities. Near Estoril, the majestic Sintra Mountains cast a veil of mystery over the town nestling on its northern slopes. The hills and the surrounding area have been classified by UNESCO as a World Heritage site both for their cultural significance and for their outstanding natural beauty. 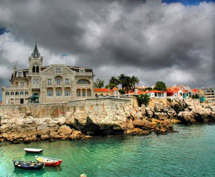 Cascais is a small beach town in Portugal next to Estoril coast in the greater Lisbon area. Cascais, former residence of the royal family and pioneer of tourism in Portugal, is a very charming village. Dominated by the bay and the imposing Cidadela fort, the historic centre is brimming with architectural treasures of a religious, military and civil nature. Likewise, the museums of the Sea, Casa das Histórias de Paula Rego, and the Municipal Museum Condes de Castro Guimarães are also must-see attractions. The first place to begin with is the Ribeira, the part of the city near the river, which is also a good place to start visiting the World Heritage area; to the other side of the river you will see the Ribeira de Gaia, a similar area from the city of Vila Nova de Gaia (the two are only separated by the river) and where you could find the Port Wine Cellars. Next go up to the São Francisco church and the Stock Exchange palace nearby, where you can visit the most impressive Arab room in the country. The world known Modern Art museum at Serralves and the Casa da Música (House of Music) concert hall live in the area known as Boavista. From there you can reach the amazing ocean front drive, known as "Foz". Go back to the center of the city and visit Mercado do Bolhão, a traditional market of fruits, vegetables, fish and meat. Next the Aliados and the City Hall and finally the 6 bridges connecting Porto to Gaia over the Douro river, many of them providing an excellent view to the river. Porto is a mysterious city that reveals its charm to the visitor through time. Take your time, wander through the mazes and alleys of the city. Take in the old, bohemian spirit of the city. Hike through the Ribeira and Foz do Douro regions (the latter, at sunset). Porto may not be in every tourist's Iberian Peninsula itinerary, but it's well worth a visit if you want to see a city that has changed economically, but that has kept its old traditions, something that is being forgotten in Europe today. National Museum Soares dos Reis (Portuguese: Museu Nacional Soares dos Reis), located in the ancient Carrancas Palace, in Porto, Portugal, is one of the most renowned Portuguese museums. The museum Soares dos Reis, founded in 1833, is Portugal's first national museum. 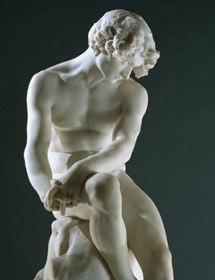 It displays one of the finest collections of Portuguese art, in particular a gallery of works by Portuguese sculptor António Soares dos Reis, after whom the museum is named. The museum has a vast collection mainly focused on Portuguese art of the 19th and 20th centuries, including painting, sculpture, furniture, metalwork and ceramics. A contemporary Museum designed by the famous architect Álvaro Siza, with a huge garden/park and an Art Deco Villa. When visiting this foundation you can visit the exhibitions, relax at the park, have lunch at the restaurant, bar or tea house and explore the shops or the library. Near Praça dos Leões. It's an old Bookshop, with an amazing interior, where you can also have a coffee. Voted as one of the most beautiful bookshops in Europe. Vila Nova de Gaia is a city in Oporto (Porto) district of Northern Portugal. It is home of cellars of port wine, several shopping centers and some of the best beaches. Perhaps the most famous tourist attraction in Gaia are the Port Wine Cellars, warehouses where the famous Port wine is stored. The Cellars are placed in Ribeira de Gaia, an area of the city located in the bank of River Douro opposite Porto. Ribeira de Gaia has also some typical and international restaurants, particularly in Cais de Gaia. Even if you are not in visiting the cellars, you should visit Ribeira the Gaia in order to get some amazing views of Porto. Guimarães is a city in Minho, Portugal and is one of the most historical cities in Portugal, said to be where "Portugal was born". It is the first city of Portugal, and have a beautiful Castle, and a Palace to visit, from the beginnings of the country. 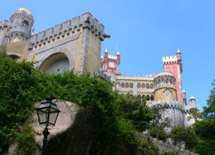 The Castle has been classified as one of the New Portuguese Seven Wonders. The first King (D. Afonso Henriques aka D. Afonso, I of Portugal) is still being idolized by the city. Placed about 50 km from Porto, Guimarães is placed near to a mountain, Penha, with wonderful views to all the city. Guimarães Castle, located in the very centre of the city, this castle have been constructed in the X Century, ordered by Mumadona Dias, with the purpose to defend the city from the Muslims. The first name of the Castle was "São Mamede Castle", name given by Mumadona. The first king, Afonso Henriques, lived in this Castle, and started conquering Portugal from the Muslims from this place. Very well kept, the castle is of the greatest historical symbols in Portugal. It has been classified by UNESCO, as World Heritage. Viana do Castelo is one of the most beautiful portuguese cities, in the Minho-Lima subregion of Northern Portugal. 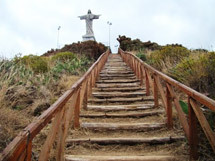 The Pilgrimage of Nossa Senhora da Agonia and the amazing views of the Lima River maked this city unforgettable. Classified as the Mecca of Architecture, the city is famous for the monuments in and around the city, and the surrounding natural beauty. Basilica of Santa Luzia, on Mt. St. Luzia - Constructed in 1903, it was inspired by the Sacré Coeur de Montmartre in Paris. From the basilica's location on top of Mount St. Luzia, there are spectacular views of the city and the beach. The best view of the city can be seen from the pinnacle of the church, accessible from the church through an elevator or through the stairs. You can reach the basilica either by car via the Santa Luzia highway, or by taking the Santa Luzia Elevator. Braga is a city in the Cávado Valley of Northern Portugal. It is the fifth largest city in Portugal,after Lisbon,Porto,Amadora and Vila Nova de Gaia.It is an ancient and modern city,one of the most important Archdiocese. Bom Jesus do Monte is a Portuguese sanctuary in the surroundings of the city of Braga, in northern Portugal. Its name means Good Jesus of the Mount. The Sanctuary is a notable example of pilgrimage site with a monumental, Baroque stairway that climbs 116 metres (381 feet). 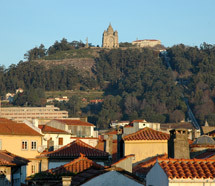 It is an important tourist attraction of Braga. Funchal, capital of Madeira, is located on a bay and started out by occupying a small extension of land by the sea, going up the mountain slopes as it grew. A few walking minutes away it is possible to stroll down the centre of the city, where you have access to all commerce and services, and can also visit the town’s main ex-libris. It can be divided into 3 historical nucleuses, which are also its first three parishes: São Pedro, Santa Maria Maior and Sé. The Historical Part of the city, in Santa Maria Maior, was initially an area for fishermen and craftsmen. Recently remodelled, the ancient part came to life with its bars, restaurants and lounges. The city market, known as Workers’ Market, is located nearby. This market is a picturesque place overflowing with Madeiran atmosphere, sprinkled by an amalgam of scents, fresh fruit, flowers and spices. The fish market is also in this area. Here you can find all kinds of typical fish and seafood of the Island, such as black scabbard fish, tuna, limpets and wrasse. 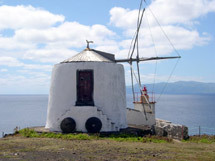 Also near the Historical Area is the Madeira Story Centre, where the visitor can get to know the history of the island. It is also in the vicinities of the Historical Area that you can find the teleferic station, which links the town to the Monte. 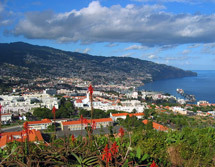 Monte is the highest parish over Funchal, known for its history and botanic heritage. 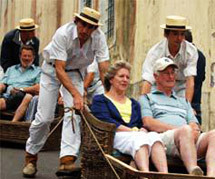 After visiting, those with a healthy heart and lovers of adrenaline, can slide down in the traditional wicker toboggans, a means of transportation that was very usual in the older days. Half way between Funchal and the Council of Santa Cruz, in Caniço de Baixo, you can find the first exclusively nautical reserve made in Portugal known as Garajau’s Natural Reserve. Just a mere 9km away from Funchal is Câmara de Lobos, a town which was, until not too long ago, a fishermen’s town, known as such since the discovery of the island, thanks to the sea-wolves inhabitating the bay. 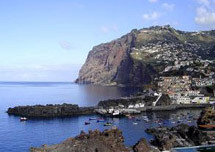 Câmara de Lobos also became known due to Winston Churchill’s paintings. Also part of the Council of Câmara de Lobos, the belvedere of Eira do Serrado allows seeing Curral das Freiras, a huge valley under an amphitheatre of mountains spread perpendiculary, shelters a remote village in its lowest part. 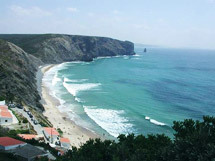 At the North of the Island, crossing the central ridge, stands São Vicente, located in the mouth of an imponent green valley abounding with Laurisilva. The town has a Volcanology Centre at the São Vicente caves, where you can visit the impressing underground lava corridors and get to know other geological wonders. 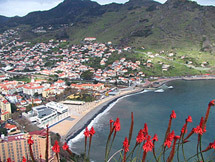 In July 1419, João Gonçalves Zarco and Tristão Vaz Teixeira, who discovered the Islands, came ashore in the beach of Machico. This same beach is now covered with golden sand. To know the history of the municipality, the best thing to do is to visit the Museum Nucleus in Solar do Ribeirinho. If you are staying in Machico, it is worth going to Caniçal, a fishermen’s village which was the centre of whale hunting, testimonies of which can be found in the Whale Museum. The town is famous for its restaurants, which serve typical delicacies, such as limpets, periwinkles, wrasses or fresh “castanhetas” (small fried fish). 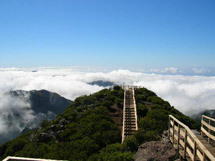 A drive to Pico do Areeiro, the third highest part of the Island, offers visitors a magnificent landscape of the central ridge and its peaks. The footpath connecting Pico do Areeiro to Pico Ruivo is one of the most beautiful, but also one of the most challenging ones. For those who cannot cross it and still wish to enjoy the magnificent landscape from the highest spot of the island, an alternative and much more accessible footpath allows reaching the peak through the other side, starting the route in Achada do Teixeira in Santana. Mostly known for its typical straw houses and for the Theme Park, a fun place for all ages, crossing the history, tradition and culture of Madeira. Santana offers one of the most beautiful strolls on foot, with 6 parishes that invite you to discovery (Arco de São Jorge, São Jorge, Santana, Faial, São Roque do Faial and Ilha). Porto Santo, located some 40Km Northeast of the Island of Madeira, has few population. It is very quiet during most part of the year (except in August, when many summer tourists visit), and is a small idyll for those seeking to run away from stress and to rest. 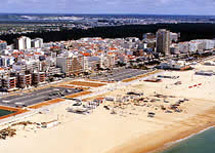 The 9 km extension of its golden sand beach, bathed by crystal and serene waters (which are never below 17º C), is particularly appreciated by those who enjoy going to the beach, which is possible to do all year long, for temperatures vary very little along the year (23ºC in the Summer and 19ºC in the Winter). The capital of Porto Santo is called Vila Baleira, where there are daily connections to the Island of Madeira, by air or sea. Propitious to water sports, diving and big game fishing are the most popular modalities in the Island, although it offers good conditions for sailing, canoeing, wind-surfing and kite-surfing. Much less hilly than Madeira, the island of Porto Santo is perfect for bicycle strolls. Bikes can be rented in hotels or in downtown. For those who are not fond of pedalling, they can also rent 2 or 4 wheel bikes, or cars. Lagoa da Fogo (Fire Like) is a beautiful caldera lake high up in the mountain and know for it's dramatic views and white sand beach. At Faial Island see Horta Harbour where all sail boat stop, Faial Caldera and Capelinhos volcano Pico Vulcano São Jorge green mountains and cows that produces the famous S. Jorge cheese. Visit the vineyards. There are many throughout the small island but each one is slightly different. If it is the right time of the year see if there is a running of the Bulls, a traditional activity done every year in which people line the streets and watch locals who are brave enough take on a bull to see if they can outrun or get close enough to touch its horns. Be Careful though, if you want to watch make sure you are sitting on a high wall or standing behind something the bull will not beable to knock down if they charge at it. People have been known to be severly injured at these events. 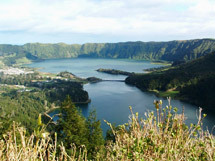 São Miguel has several calderas, and hot springs can be found scattered over the island; mostly in the middle highlands. In the west there is a caldera and volcano crater that is almost filled by the beautiful Sete Cidades twin lakes and the town of Sete Cidades. Steep mountain walls surrounds the lakes, one is azure blue, the other is greyish, and this is explained in a local myth. This is the capital and location of the main airport (João Paulo II), as well as the main economic center of the island. 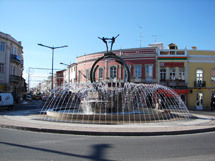 The historic center and most tourist attractions are located along the Avenida Infante D. Henrique which extends from the fort of São Brás in the southwest of the city to Clube Naval and the southeast Marina, and includes Campo de San Fransisco, the Matriz, the "Portas da Cidade" (the City Gates) and the new "Portas do Mar" development. 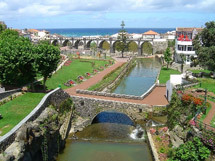 The second largest city on São Miguel is the gateway to the north and 20 minutes away from Ponta Delgada. It is known for its beautiful historic center and the northern beaches known for windsurfing, as well as being one of better access points to Lagoa do Fogo crater lake.